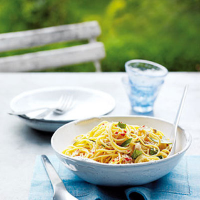 Super-speedy yet very stylish, this supper dish can be on the table in 10 minutes. And with just six ingredients, it couldn’t be simpler. Cook the pasta in a large pan of boiling water for 3 minutes. Meanwhile, heat the olive oil in a small pan and cook the chilli for 2-3 minutes until softened. Add the lemon zest, crabmeat and a ladleful of water from the pasta pan. Season with freshly ground black pepper and heat gently until the crabmeat is piping hot. Drain the pasta well and return to its pan. Add the crab mixture, basil leaves, and lemon juice to taste. Toss well, divide between 2 bowls and serve immediately. Try adding chopped ripe tomato to the chilli for extra colour and texture. Use cooked prawns or scallops instead of crab. La Grille Classic Barrel-Fermented Chenin Blanc, Loire, has lovely peach fruit flavours and goes especially well with seafood.